anne threatened to get me a weird pan after this entry of mine. In fact, she said my complaining about that pan (and the pointing out of the TV ad every time it came on) just said that I wanted one of those pans. When she showed up with a rather large and heavy box, I sort of assumed that it was one of the dreaded pans to "help me cook like a pro", maybe with a brick inside of it to make it weigh so much. I should have known. 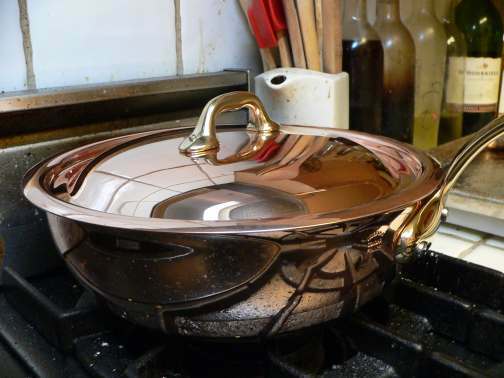 It is a beautiful copper saucier. It's shiny (but not for long) and heavy (the lid alone is 1.5 pounds!). The first thing I did the next day was to place the pan on my dirty dirty stove from the night before and take a picture.